Are you interested in learning HTML 5 and looking for good presentation? Are you willing to take a session on HTML 5 to your colleagues or students and looking for a presentation? If so your search is going to end now. Google Chrome team has created an online HTML 5 presentation to showcase the bleeding edge features for modern desktop and mobile browsers. 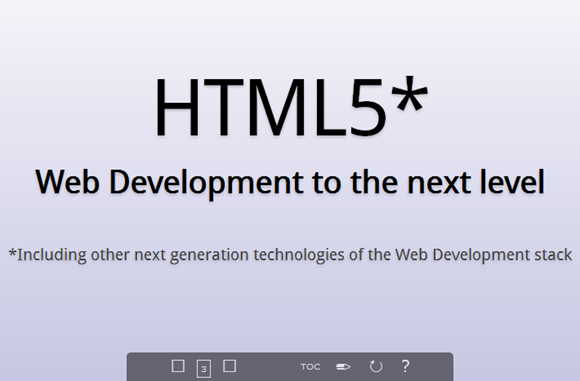 You can access the presentation at http://slides.html5rocks.com and present it audience with working demos of various HTML 5 features. If you want to have offline access to the presentations, you can download the entire source code from http://code.google.com/p/html5rocks and play it offline on your computer. The best part of this presentation is the embedded demos that lets you showcase the features as you present them with live hands on experience. For example in Offline Storage slide you can create a Web Sql database, create tables, add new rows, retrieve data and drop the tables. Interface of demos is very simple and easy to showcase. As they are built by Google Chrome to showcase the features they built into Chrome, it’s recommended to use Chrome browser for presentation walkthrough.